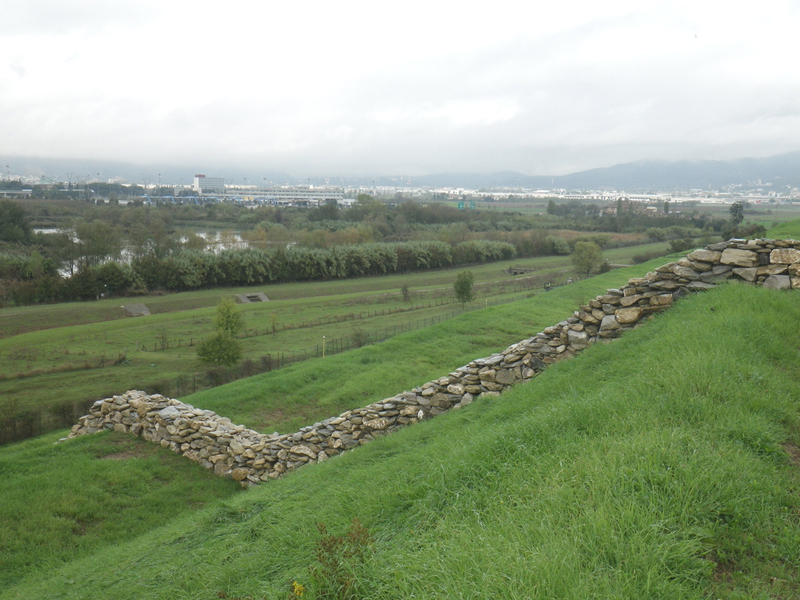 Large municipal landfills are ‘new’ features of the landscape. Their artificial forms, created to obtain the highest capacity of storage, are defined by superposed planes and very strong slopes. Landfills of this genre are an unmistakable element of the contemporary landscape whether they are found in valleys (terraced land) or on flatland (stepped pyramids). The latter kind is far more noticeable since their shape raises from a flat environment, visible from all sides. Typically, once the landfilling is over, trivial interventions of revegetation are undertaken with the illusion to be able to disguise the new mount.For the revegetation grass and, sometimes, shrubs are planted. In many cases, also non-native species are utilized in excuse of a hypothetical better taking root. 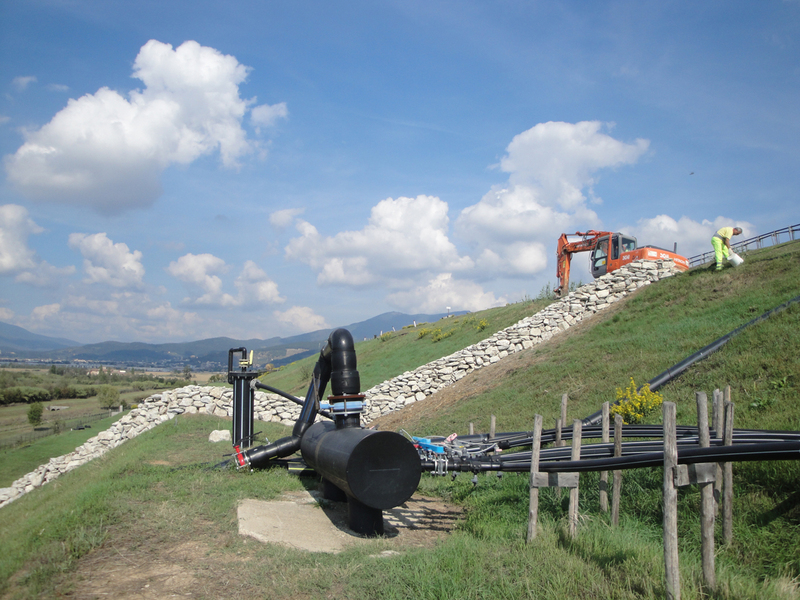 The artwork focused on one of these landfills, the Case Passerini landfill, that has served the city of Florence and four of its neighboring municipalities for the past few decades. The work, commissioned by the landfill authority, inserted this artificial ‘object’ within the surrounding area’s tissue in a completely different way from the usual interventions above mentioned. Firstly, the new pyramidal mount with large steps which has developed in few years in the middle of the plain, is recognized as one of the most authentic and direct evidence of our contemporary lifestyle. Thus the intervention does not attempt in any way to disguise this aspect and focuses instead on ecological and aesthetical characterization of the surface of the new mount which has become available, at the end of the use of the landfill, when this was covered in good quality soil. The key element of the design focused on the choice of stone material. 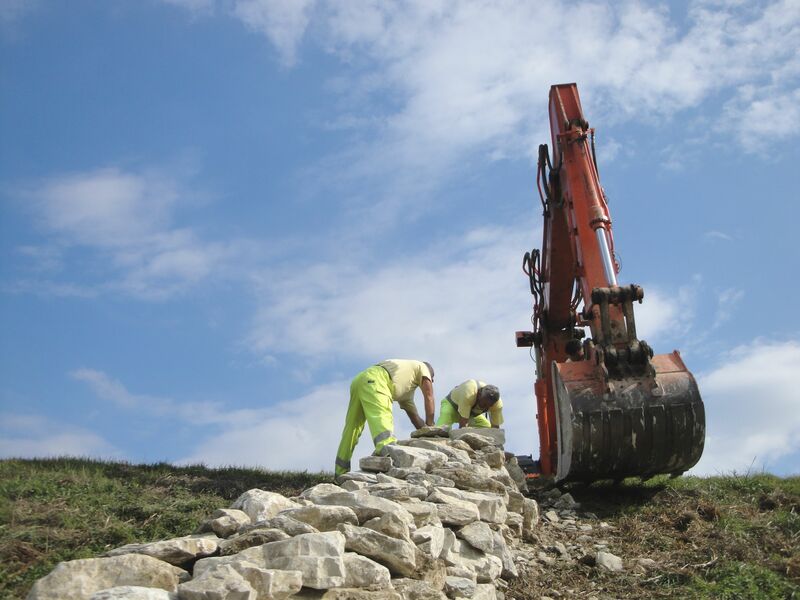 Piling the stone on the landfill surface without the use of mortar generated important shelters where faunal species, particularly those of small dimensions, may find refuge, areas of feeding, reproduction or merely as perches. 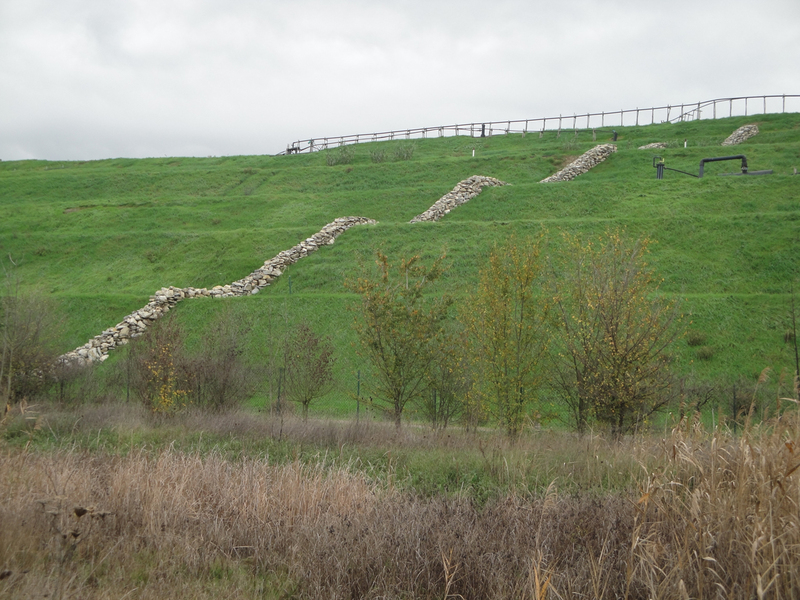 In order to effectively perform these functions, the mounds of stones were meant to be distributed in different place of the landfill. The aesthetic choice consisted in the design of a single long line that from the lowest level of the plain rises on the western side of the landfill towards the summit of the mount. A new line, thus, which cuts about orthogonally those of large steps. This linear habitat made of stone corresponds to the project upon the landfill of an old canal route ‘Aqualunga’ which used to flow through the territory before the landfill took its place, as it is seen in older maps. This canal, like all watercourses, used to be linear habitat to many aquatic species. The deviation of the canal allowed the landfill to be built. The area thus became inhospitable to any wild species. The route of this canal was once again redrawn on the slope of the mount and transformed into a habitat of stones, which can be colonized by faunal species. Of course, no longer aquatic species, but species adapted to rupestrian habitats that has suddenly become ‘available’.Linear habitat is an artwork made of juxtaposed stones, of holes, of countless gaps. It is a penetrable and habitable reality, capable of guaranteeing the permanence and the safe passage of faunal species along the mount slopes (‘corridor’ in Ecology). The decision to place the stones in a linear shape was also born from the desire to highlight another important aspect: the ancient course of the ‘Acqualunga’ canal marked out the administrative boundary between the two municipalities of Campi Bisenzio and Sesto Fiorentino. Although the watercourse was diverged from its original path due to the building of the landfill, nowadays its old line still determines the administrative confines of the two municipalities. The construction of a linear habitat as a function of an ecological corridor along a political-administrative boundary (element in itself void of real environmental significance but everywhere loaded with political meaning and thus par excellence in history theater of arguments, disagreements and even struggles or battles) seeks to be highly provocative. So, this work brings to the forefront the need to conceive the landscape always as a unicum, a common heritage, indivisible and independent of political boundaries. It needs to be interconnected to guarantee the conservation of life. Closed landfill consisting of a little mount with large steps covered in soil. 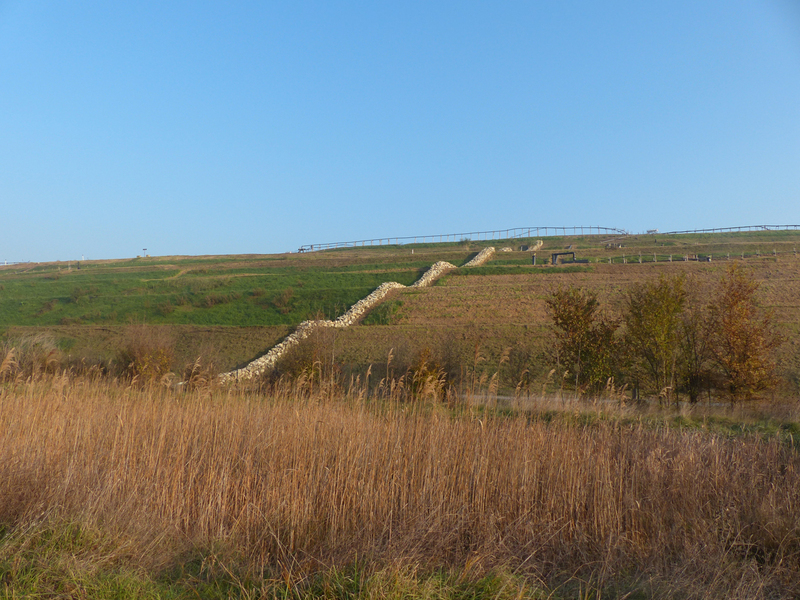 Work built by stacking linearly about 300 tons of stone, 1 x 1.5 x 100 m.
The used material is typical of the hills surrounding the plain. Within, because of the steep slope of the landfill, every 6 m there is a reinforcement (large wire net) to prevent the slippage of stones. In the meantime, this kind of net allows the easy passage of faunal species inside the structure. - Amphibians (with particular reference to: Italian crested newt, Triturus carnifex; Smooth newts, Lissotriton vulgaris; green toads, Bufo viridis; Italian tree frog, Hyla intermedia): refuge throughout the winter and summer periods. - Reptiles (with particular reference to: Moorish gecko, Tarentola mauritanica; Slow worm, Anguis fragilis; Western green lizard, Lacerta bilineata; Common wall lizard, Podarcis muralis; Italian wall lizard, Podarcis sicula; Western whip lizard, Hierophis viridiflavus; Grass snake, Natrix natrix): refuge. - Little Owl (Athene noctua): refuge and perch. - Hedgehog (Erinaceus europaeus): refuge.